Fans of Channel 10’s awesome hit drama ‘Offspring’ will certainly know the new single from Melbourne songstress Emmy Bryce. 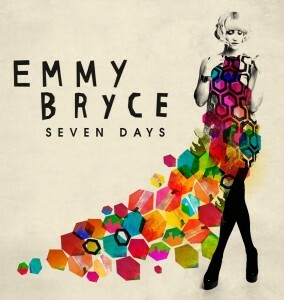 The cute-as-pie track, entitled ‘Hit The Ground’, was recently featured in an episode of the show and has subsequently taken on a life of its own, picking up interest at radio and refocussing the public’s attention on her debut EP ‘Seven Days’ (stunning cover image, pictured). To celebrate the release of the single, Emmy is about to ‘Hit The Ground’ running for a series of five live shows from later this month. She’s set to kick things off in her home town before playing Sydney, two shows in Canberra and a gig in Adelaide. Tickets for all, as well as the EP, are on sale now.